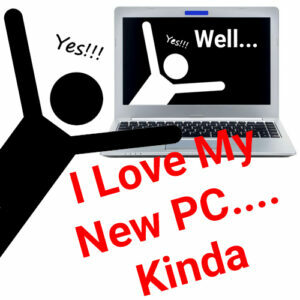 Home » How We Can Help You » Your New PC! Congratulations on your new PC! Maybe it’s your new Black Friday, Christmas, or New Year, New You PC, anyway you got it, it’s new! So I’ve got a couple tips for you on ways to make your brand new computer super awesome. My first tip is on your new laptop or desktop PC immediately run out and get yourself a new mouse and keyboard if you have a laptop you may just need the mouse. Most computers ship with very cheap keyboards and mice. For a smart and immediate upgrade (for not a lot of money) you can pick up a really nice Wireless Logitech mouse and keyboard combination. Or for those laptop users you can pick up just a mouse. A lot of times these 20 to $30 investments can really increase the usability of your computer and the same time cut down on the number of wires you have running back and forth to your PC! My number 2 suggestion is to get your hands on a good cleaning cloth (microfiber is the best) some lens cleaner, and some rubbing alcohol (90% or better). Your computer is going to get dirty and your screen is too. One of the best things you can do for yourself is to take care of your new equipment by periodically cleaning it. Your screen would definitely love a little love and by spraying a little lens cleaner on your cleaning cloth and cleaning off your screen at least once every two days you can keep your screen and great shape and easy to read. You can also take a little of that rubbing alcohol that you bought and put it onto the same microfiber cloth and use it to keep your keyboard clean and free of germs. Lots of times computers are shared among many members of the family and believe it or not computer keyboard can be a great way to spread germs. About once a week you should clean your keyboard more frequently if there are colds around the house. I number 3 suggestion is get a data transfer. A lot of times people get computers for Christmas as a replacement for Old PC. Unfortunately that usually means that all of your data on your old PC gets lost unless you bring it in for a transfer. Any computer guy (NCG) should have the ability to take the data from your old computer and transfer to the new PC. That way you are able to take all of your memories, your pictures, your documents, and files from your old PC to your new. Also one of the cool benefits of doing this is you will not need to waste any money on buying costly USB flash drives or external hard drives for transferring data to and fro. Most of the time your computer guy will simply set up your computer to read your old hard drive and copy the data directly over. Whenever you get a new computer you are going to be shocked at how many passwords you’re going to be stuck remembering! Find yourself a method of doing passwords or take a look at the tech tip I did on passwords to help make it a little easier for you to deal with all these damn passwords! And don’t forget to take notes! It is insane to think that you will remember every single password that you will make and if something happens to your computer, or to you, you may be left without the ability to log into some very important accounts. Never forget to keep a copy some place whether it’s on your computer or and a notebook, Keep it someplace you will remember! Keeping notes will definitely keep you from needing me to hack your computer. Step 5 Always use common sense along with antivirus. A lot of times people get antivirus on their computer and think it’s going to stop every single infection that’s going to come their way that is not even remotely true. If anybody sells you any antivirus product and tells you, you no longer have to worry about getting viruses is a liar. Antivirus is a great first step but I’m not going to lie to you it is the least important step. The most important thing you can do to not get a virus on your computer is make sure you read everything that pops up on your machine and you don’t just click blindly on every single thing you see. That is the number one way people get infections. Remember viruses and the people who write them are literally changing them every single day of the week, in fact in the time it took you to read this last sentence, I’m betting that three new viruses were probably invented. Antivirus is always a game of catch-up, and there has to be a patient zero for there to be an answer! So you are always going to be playing the update game. By simply making sure you read everything you were given, and making sure you don’t click on random links, and do not install programs that you do not need on your computer, and treating everything you see on social media with a bit of skepticism you can be quite safe. I hope you enjoy your new computer and you have lots of fun exploring your new machine!! If you have any additional questions don’t be afraid to give me a call I’m always happy to help! ← Passwords. I HATE PASSWORDS!